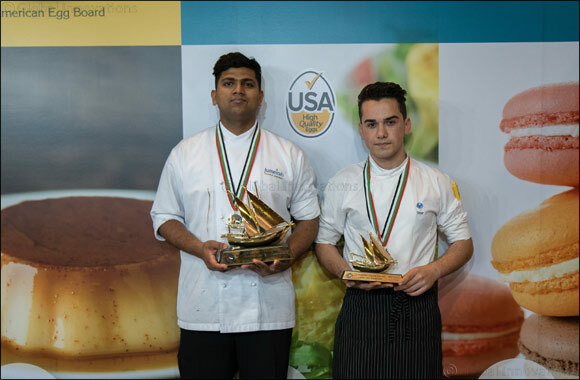 Dubai, UAE, March 21, 2019 – Winners of the Egg Class Competition and the Middle East Young Chef of the Year Award were announced at the recently concluded ExpoCulinaire 2019. Traditionally held within the Gulfood exhibition, ExpoCulinaire is a series of culinary competitions accompanied by a trade event that is dedicated specifically to the culinary community. The awards for the Egg Class Competition and the Middle East Young Chef of the Year Award competitions were sponsored by the American Egg Board (AEB), the research, education and promotion arm of the U.S. egg industry. AEB's partner, USA Poultry & Egg Export Council (USAPEEC) along with the Emirates Culinary Guild assisted with the organization and coordination of AEB's ExpoCulinaire participation in Sharjah, UAE. The judging panel included Vivek Huria, Corporate Chef at ANGT LLC and Vice President Ras Al Khaimah of the Emirates Culinary Guild, Bilal Saleh, Head Chef Local Concepts at Meraas Sikka Cafe, Al Mashowa, Homestead & Bakery and Mahesh Jayasinghe, Cluster Executive Chef at Golden Tulip Hotels, Suites & Resorts and participating chefs were required to use U.S. eggs and egg products in their preparations. The Egg Class Competition had five international and local chefs battle it out for the top spot. Mr. Jo Ingeun from South Korea, representing the Korean Cooking Art Academy, walked away with top honours, with the judges particularly by with Mr. Ingeun's dish U.S. poached egg set on a Focacia bread topped with turkey ham for its creativity and taste. “I am very excited to have won the Egg Class competition. This win is a huge accolade for me and I look forward to building on this success,” said Mr. Ingeun. Previously part of the Gulfood exhibition, this year, The Middle East Young Chef of the Year Award was held at the ExpoCulinaire 2019. The competition aims to discover upcoming talent and encourage them to develop and improve their culinary skills. This year, Kanishka Gamage from Madinat Jumeirah's Pool Kiosk took first place. The runner up from last year's competition, this marks the second time Mr. Gamage has participated in the competition. Taking second place was Yasar Ilbira from Turkey, a chef at Teatro in Towers Rotana Dubai. Participants at the Middle East Young Chef of the Year Award Egg Class were required to prepare three dishes including an Emirati dish, Live category (chicken butchery and omelettes) and Poached eggs.